A jazz rooted saxophonist who briefly flirted with rock ‘n’ roll in the late 1940’s as jazz’s commercial prospects were cooling and rock was heating up. 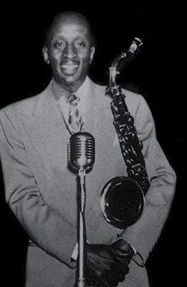 Ulysses Banks was born in 1909 and had been a professional musician since the early 1930’s. Though never a major player on the scene he’d been with some noteworthy bands, playing with Jack McVea in Charlie Echols band in the 1930’s and later being a featured component of Cee Pee Johnson’s acclaimed early 1940’s outfit. By the mid-1940’s the prospects for second tier jazz combos were diminishing and Banks started his own group featuring trombonist Allen Durham, the two decidedly different lead horns giving them a somewhat unique sound. A turnover in band personal led to wholesale changes with the exception of Monk McFay on drums and first-rate guitarist Frosty Pyles, as now Welsey Huff took over the trombone to keep that sound intact, as it was now becoming their trademark (rather than being joined by the more usual trumpet). Backing a succession of female vocalists on record, including Marion Abernathy (recording as The Blues Woman and getting them their only big hit), Fluffy Hunter and Baby Davis, all of which were quite good but didn’t improve their national visibility much, as they settled into being a largely West Coast club act. When they landed at Specialty Records they turned to the burgeoning rock scene in an effort to connect there but within a year the band broke up. Banks re-appeared behind old friend Fluffy Hunter for a 1963 session before fading from the scene. Reportedly he may have switched to piano and played that instrument in clubs for the rest of his days, but no further recordings were made and Banks passed away in 1991 a month shy of his 81st birthday.